Philippe Hoerle-Guggenheim is a name to know when you’re looking for a gallerist who’s grasp on the art world knows no bounds. He has an ability to speak about art in a down to earth way and to use art to hone in on what anyone is looking for, a human connection. His well established contemporary art gallery in Chelsea opened in 2014 after a strong career in finance. Philippe felt the need to fulfill that creative buzzing in the back of his mind and manifested relationships that propelled him into the art world that he’d grown up appreciating. Art was always a part of his family, and museums were often frequented at a young age. In 2014 he opened HG Contemporary in Chelsea and never looked back. More so, if you take a closer look at Philippe’s success and the exhibits he’s crafted, you’ll sense a running theme: Word Play. Starting with his exhibit RETNA made by street artist Marquis Lewis which centers around typography and unique letter forms. Word play has always been a theme throughout his life as he speaks of Laura Kimpton, an artist in the burning man community whose work also landed in the HG Contemporary gallery this past May, finds meaning in words as she uses mixed media to create her own elaborate word play. Now Philippe is stretching this subtle theme that runs throughout his life over to Madrid with a second gallery opening for HG. His first exhibit is a collaboration between Alejandro Sanz and Domingo Zapata who were featured in Chelsea with their Picasso-esque pieces and a word play addition. As his own personal homage to literature he has a book in the works of short stories that he hopes to have artists he admires illustrate. As HG’s success grows so does the ability to expand and make a world impact. His philanthropic ventures landed him on the board of Elevate New York Inc., an after school mentoring program to influence kids in communication and team building skills. To further reinforce a positive change in the world, his most recent exhibit by Carl McCrow, “One Less Gun” is dedicated to the destruction of surplus guns in an attempt to save lives. Through all of this philanthropic success and work comes a strong mission statement for HG Contemporary Madrid, to connect people worldwide with art. Yet another constant thread in Philippe’s career, human to human connection. 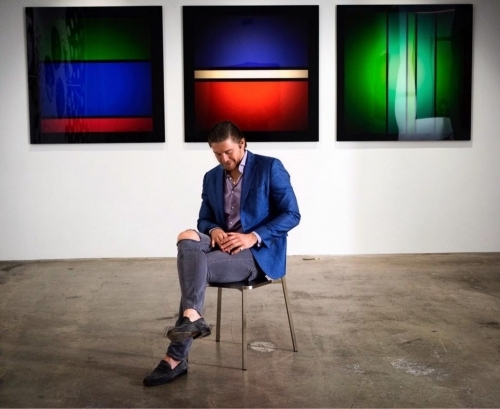 His third gallery recently debuted in Napa Valley July 2018, featuring works from Tim Bengel and later sculptures by Niclas Castello. In true HG Contemporary fashion, Philippe has an augmented reality based project in the works. A more immersive way to see artist’s work and even purchase it. So if you’re not within HG Contemporary’s reach, soon it will be just a click away. From August 10th to September 5th 2018 at HG Contemporary, “Surface(s),” an exciting group exhibitionfeaturing a variety of mediums and styles from portraiture, to conceptual work utilizing guns, to abstract embroidery, will run. The show will feature artists Alexandra Grounds, Jerry McLaughlin, Stephen Wilson, Carl McCrow, Solange Umutoni, Anna Zaia and Mehwish Iqbal.